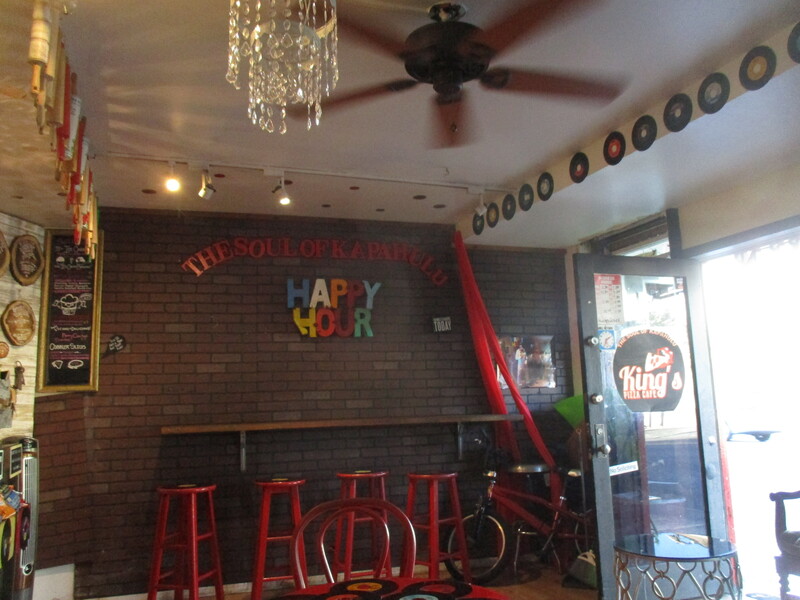 If you head down Kapahulu away from the beach, past President Thomas Jefferson Elementary School, and just a little farther beyond, you’ll find a tiny restaurant called King’s Pizza Cafe. Voted as the community’s best pizza, it serves them up by the slice and always freshly made. By Oahu’s food standards, it’s a bargain. In a place where two burgers, a side of fries and one drink is regularly $30, getting two large slices of pizza and two drinks for around $10 is a bargain. The slices we had were cut in half, so it was more like getting two slices of pizza rather than one giant slice. The Queen’s Pizza was by far the best of the two varieties we tried. Stacked full of correctly crisped pepperoni, olives and other great pizza ingredients, it played the best in our mouths. The Chicken Ginger Pizza was a little less successful. It provided a clean ginger flavor, which is what it’s supposed to do, but I wasn’t as fond of it as I was my wife’s choice. Both pizzas featured a sauce that was the right amount of sweet and tangy, and the crust was edible on its own without reservation. The atmosphere is eclectic 1950s through the 1980s. Tables are topped with 45s or LPs from the 1980s. DJ cats playing pizza on the turntable are on the throw pillowcases, and a variety of other pizza related items are available for sale. King’s Pizza Café is a nice-priced oasis with great food in a desert of high-priced mediocrity. Come for the break from the hub bub and high prices along the beach and enjoy a slice of goodness. When you’re done,you can head up the street a little more and get to Leonard’s Bakery for dessert (and even getting six Malasadas, you’ll still be ahead of most dinner options that aren’t fast food in the area).